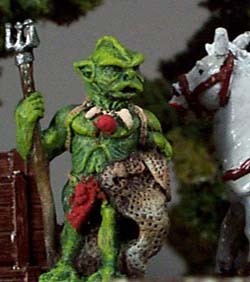 The Nagis is an amphibious race that started out as swamp dwellers. All of their current settlements are built on or near water with the majority of them still being found within swamps. Sometime in the past the Nagis learned shipbuilding. With the Nagis’s natural affinity to water, the race developed the greatest sea bound explorers that the world has ever known. Not only has the race mapped the coastlines around the world, but it has also set up and become the greatest trading empire that the world has ever known. This, despite certain disadvantages that the Nagis had to overcome. First, the Nagis is quite comfortable spending much of its time in water. The Nagis’s skin is very oily in nature. In fact, if a Nagis spends to much time out of water its skin will dry unless it uses oil to keep it moist. The oil is easy to obtain although the Nagis will go through a full flask of it each day while out of water. Twice this amount is required when the Nagis finds itself in hot climates. The Nagis is cold blooded, meaning that it slows down as its body temperature drops. Because of the amount of time spent in the water, the Nagis have developed excellent underwater hearing and sight. Underwater their vision is equal to a normal human that is out of water. In addition, they may tell the direction to a sound, whether submerged or on land. The Nagis’s webbed hands and feet give the creature a great deal of natural swimming skill. May carry 11+1d2 very large items. The Nagis grows to between five and a half and six and a half feet tall and will normally weigh between 220 and 260 pounds. The Nagis character starts out with the skills of Swimming, Swamp Craft and Water Craft at a synergy level of 12+0. This is in addition to the skills the starting player may pick for the Nagis. The Dice rating that goes with Swamp Craft goes from Regular 1 to Easy 2 for the Nagis. The Dice rating that goes with Swimming goes from Regular 1 to Easy 3 for the Nagis. In addition, whenever the character attempts to increase the level of these skills, he or she can add 4 to the dice roll. A Nagis may retake (once) any failed swimming test that indicates that it is swept away or under by a current. In addition to this, the Nagis may hold its breath for up to 10 minutes. Have the character roll percentile. If the roll is 20% or less, the character has one of the following skills; Merchant, Navigator or Shipwright (players choice). The player does not have to make this check since the skill will count towards the total number of life skills the character can have. It is very easy for the Nagis to learn the following skills; Awareness, Detection, Determination, Identify Sound. In addition, the dice associated with these skills goes from Regular 1 to Easy 2 for the Nagis character. The Nagis finds the following skills harder to learn; Climbing, Desert Craft, Disguise, Escapist, Locksmith, Mountain Craft, Reduce Fall, Sleight of Hand, and Winter Craft. The Dice figure associated with these skills goes from Regular 1 to Hard 2 for the Nagis. The Nagis have a Cultural thing against shields and find it hard to learn to us any shield. The Dice rating of the Spiked shield goes to Hard 3. The Dice rating for all remaining shields goes to Hard 2 for the Nagis. The Nagis have a Cultural thing for the net as a weapon. Only the Nagis Character may learn the use of a net. The net is used in place of a shield so the Nagis can learn the Net plus a Weapon skill. The dice rating for the net skill goes from Regular 1 to Easy 2 for the Nagis. The Nagis takes double the normal exposure damage when in cold climates. The Nagis takes double the normal exposure damage when in hot climates. If the Nagis takes any damage from a cold–based spell or effect, then he/she will be slowed for the following round. This means that the Nagis must double his attack speed dice rolls. If he rolls over half on the dice, then he does not make that attack (i.e., if he is using a weapon or casting a spell that has an attack rank of 24/2d12. He rolls the 2d12 and doubles it. If the final figure is greater than 24 then he does not get that attack/spell on that combat round). Each individual cold–based spell will slow him for one combat round unless he gets himself stuck in an area or spell affect that continually damages him from round to round. He must actually suffer cold–based damage in one round to be slowed in the following round.